Whether you are serious about training or a beginner you want a spin bike that is going to fit you properly, provide a stable riding experience and be able to stand up to tough workouts. It also needs to be able to be used in the home without annoying others living there. The Bodycraft SPT Indoor Group Cycle is a bike made for commercial use but can also be used in the home. From this you’d think it should be able to stand up to home use but it is important that it isn’t very noisy, cause a lot of dirt and be able to be moved out of the way when needed. In our review we look at all those aspects of the bike to ensure it meets the requirements of the home. We’ve studied the manuals, the product listings, customer reviews and asked question of Bodycraft to come up with a complete picture of how this bike stacks up. The bike frame is made from heavy duty steel and coated to prevent rust and corrosion. The bike is sturdy and robust with there being no wobbling or flexing whatever workout or training you are doing. It holds you steady whether you are in the seat, out of the seat or transitioning in between. You feel secure and know you can just concentrate on your workout and not worry about being tipped off. The 46lbs flywheel is perimeter weighted to provide the required inertia to bring the pedals through to promote a good strong cycle motion and give the feel that you are rolling down the road as you get on an outdoor bike. Your legs and feet go through the whole circular motion of the pedal stroke reducing impact on the joints which can be helpful if you have a leg injury as its low impact nature. Underneath the stabilizer bars are levelers that can be used to level out the bike if the floor is uneven to avoid any side to side rocking. The bike is fully adjustable with both the handlebars and seat able to be moved horizontally and vertically to get the bike to fit you properly. It makes it possible to get it very close to your outdoor set up if you want or you can just set it up so you get the best setting for your workouts for comfort and efficiency. You aren’t restricted by pre-set holes in the tubes you can micro-adjust the seat and handlebars to exactly where you want. The moving of the seat and handlebars is quick and easy. You loosen the levers and then slide seat or handlebars to where you want and then tighten the levers in place. You do need to ensure the vertical adjustment poles especailly are fully tightened to ensure they hold in place while you ride to them slipping and you falling off. It is good practice to check this each time before you use the bike too. This speed and ease of adjustment does mean it makes an ideal bike for multi-users to do their training and cardio workouts. It only takes a few seconds and you can then be up and cycling when it needs adjusting before you workout. As well as the adjusting being quick itt can be used by all levels of ability too. The limits on moving the seat is that it can be adjusted between 28 and 37 inches from the pedals (the company doesn’t reveal the recommended heights as it can vary from person to person due to leg length). The bikes uses a brake pad that sits on the top of the flywheel to provide the resistance needed for hill climb workouts. The amount of resistance you want is set by turning the resistance knob that sits at the top of the frame which is in easy reach. The increases are incremental and consistent making it easier to get to the required level of resistance you want. However, there are no markings to let you know where you’ve set the resistance to. You can only determine the level by estimating and by feel especially when wanting to return to a previous setting. To be able to set resistance with more certainty the Bodycraft SPR gives you the ability to see levels of resistance. It has magnetic resistance (low maintenance and silent), it has the same handlebars with a lighter flywheel (38 lbs) that is situated at the back of the bike. (out of the sweat zone) but it is about $500 more. You can read the full review here. To prevent sweat from dropping on to and damaging the flywheel and resistance there are guards over the top of them. This keeps them in top working order and looking good for longer. The bike has a fixed gear which means the pedals keep turning when the flywheel is turning so there is no ability to coast as there is with a road bike. It helps to keep the pedals moving and keep your legs moving. The belt drive is a v ribbed automotive belt that give a better grip on the axle and are harder wearing. This results in a non-slip and low maintenance ride. The belt will work for many years without requiring maintenance but will require replacing at the end as it will stretch and cause it to slip. The replacement does require specialist tools and skills. The drive is protected by a guard to keep it in good working order. It stops sweat and dirt getting to it. This also stops your ankles, clothes and children’s fingers getting caught up in it. The pedals are designed for normal athletic shoes only. They come with straps and toe cups for sliding your shoes into and tighten them up to give you a good grip with your feet on the pedals. Your shoes are on the pedals securely to hold you on them while you are up out of the seat. The crank length and the Q factor is 175 mm. The cranks are made from forged steel that provides a solid base for the pedals to prevent any flexing or bending. The 175 mm Q factor is reasonable for a spin bike but it is wider than a road bike so may feel uncomfortable. As general rule the narrower the q factor (the distance between the pedals) the more alignment of your feet and hips providing a more natural feel (like when you are walking) and providing less strain on your legs helping to reduce the chance of injury further. The company does sell clip-in pedals for specialist SPD shoes for around $99 or you can use your own as the thread it use is 9/16. Handlebars. The handlebars are coated to ensure you have a good grip and prevents blisters when your hands get sweaty. These handlebars are fully featured including ergo drop bars. 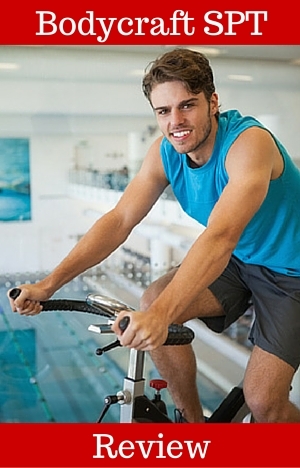 This means you can use the bike for spinning and bike indoor training. This is excellent giving you the best of both worlds. The loop in the middle can also be used for aero position but there aren’t elbow pads so your forearms may ache as the coating doesn’t make the handlebars padded enough to rest on for long periods. Noise. The bike is silent but it is very quiet with only a little noise coming from the resistance pad rubbing on the flywheel. You can hear the TV easily or hold conversations with only having to turn the volume up slightly. Others in the house won’t hear you working out and your breathing may be the loudest noise coming from the direction of the bike. Dust and Dirt This is not a dirty bike as there will only be some dust from the resistance pad and some lubricant from the moving parts. The biggest source of “dirt” is likely to be sweat which can be very corrosive, so it is important to clean the bike down after every use to keep the bike looking good and performing well. The sweat will also drip on to the floor so you may want to protect that with a rubber exercise mat. Seat. The seat has been designed for comfort. No-one has complained about it being uncomfortable but you may not like it as this a matter of personal preference. It is possible to change the seat for one that you find more comfortable but you may want to try padded bike shorts or a gel seat over first. The bike is heavy at around 110 lbs. To help with this there are 2 transport wheels that you tip the bike onto. It can take a little bit of effort to get on to the wheels, and you may find it needs two people to do this but for most it shouldn’t be an issue. These wheels take most of the weight of the bike so you can then just wheel it to where you want it to go. The bike is smart looking so if you have to leave it out because you don’t have the storage space it’s not the end of the world. To store the bike it requires a floor space of 24 by 43 inches. The bike comes partly pre-assembled with the frame and flywheel together. You are required to complete the assembly which should take between 30 – 60 minutes. There’s not too many parts to add to the bike. You need to put on the stabilizer bars, seat post, saddle, handlebar post, handlebars and pedals (remembering to backwards thread the left pedal). The most difficult bit of the assembly is dealing with the weight of the bike especially when moving the box (weighs 121 lbs) to where you want to assemble the box and when putting it on the stabilizer bars at the beginning. The tools needed to complete the assembly come with the bike. The bike doesn’t come with a console as standard. It is possible to buy a console that works with the bike from Bodycraft for $99 (price when writing the review) called the Computer with Comprehensive V2. It displays speed, time, distance, RPM, and heart rate (if compatible heart rate strap supplied). They also supply a compatible heart rate strap for $50. I like to have the data in front of me when I ride but this isn’t for everyone – some people enjoy riding without it and can just get on with it which is great – but that’s not me. You can add a bike computer to the bike but you do have to find a ways to attach it to the bike and also how to add the spoke magnet/sensors to the flywheel. It comes with a gravity held water bottle holder that is located on the main frame just below the tension knob. It is a reasonable location for grabbing your bottle when you need a drink. It is also easy to pick up and replace as you aren’t having to slide the bottle into place. It is located in a sweat zone so you may find the bottle getting wet making it slippery and a bit “yucky” to pick up. The other issue is that you do need to be careful when you get on/off the bike as you might kick the bottle off or trip over it. There are no other accessories that come with the bike – nowhere to plug your MP3 into or to place a tablet or a book. The manual does not have any instructions for beginners on how to set the bike up properly once it is assembled or how to use it. Although the bike is not for beginners but for “discriminating cyclists” and dor gym use some information on set up and maintenance would be useful. The company does supply SPD pedals and a console for the bike that you can buy in addition to the bike. There are only a few reviews of the bike currently. They are all very positive. The reviews mention how very quiet the bike is, the stability of the bike and smooth riding motion. When dealing with the company they have found them to be excellent. The bike is priced over $1000. For this you get a heavy flywheel, low noise and maintenance belt drive, multi grip handlebars, fully adjustable handlebars and a solid base for tough and intense workouts/training. When I checked online, Amazon included free shipping. The Bodycraft SPT Indoor Group Cycle is a well put together bike that provides the stability needed for tough training and low impact workouts. The heavy flywheel provides the momentum to give a natural and fluid riding experience and prevent and choppiness. It is a very quiet bike too so you are unlikely to disturb others while you workout. I’d like to see a computer come with as standard myself because I like the numbers, but it isn’t unusual for spin bikes and indoor cycles not to have one. The bike is great for those who take their training and workouts seriously. It holds up well with daily and intense use. It has been built for gym use. It comes with a lifetime warranty on the frame for home use, so there is the expectation you’ll get many pleasurable (or torturous!) years of use from it. The adjustability of the bike means it can be used by people of different heights and abilities too.